"The Way of Wisdom" is my way to describe the book The OPA! Way by Alex Pattakos and Elaine Dundon. If there were ever a solid link between old-ways and new-ways this would be the book. Add the sage touch of the Ancient Greeks and you find their ancient wisdom, well, isn't so ancient afterall. Alex Pattakos, Ph.D. and Elaine Dundon's book on the meaning of life brilliantly explores how wise ancient advice is lived by 'simple' Greek villagers today. In a modern world of Me-Me-Me, what is truly detailed within the book is We-We-We and the ramifications of living within either paradigm. From Me to We is the way I would succinctly describe the meaning of life. Of course, it isn't as simple as that and the The OPA! Way delves deep into the reasonings of what the ancients taught us, giving us profound, time-tested choices today with which to guide our lives. "A purpose-driven life is well-lived," is an amiable goal for anyone. Add a group of two or more and a community with the purpose of supporting, sharing and looking after each other is more than enough for anyone. When you have friends and family, you have everything; rather, enough. Alex and Elaine have now integrated the Greek-inspired "OPA!" concept in the newly released, revised and expanded 3rd edition of their international bestselling book, Prisoners of Our Thoughts: Viktor Frankl's Principles for Discovering Meaning in Life and Work, which is now in 22 languages. Together with my wife, Cynthia Daddona, we have been living the ancient and modern ways of the Mediterranean for years. We are happy to see that the OPA! Way book is also spreading the word. 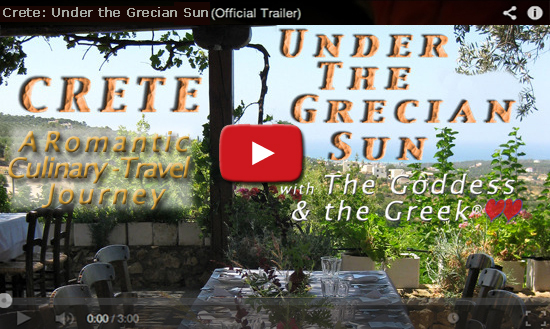 We are also doing our part to celebrate the ways of our ancestors on CelebrateGreece.com and our new romantic, culinary-travel documentary Crete - Under the Grecian Sun, was filmed on Crete which is the birthplace of the Mediterranean diet and lifestyle.